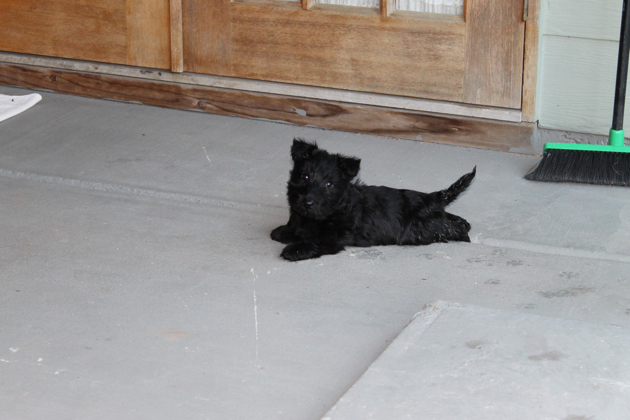 Here she is, five minutes ago, on the back verandah. Life with Gracie has been wonderful. She taught herself to roll over (very cute) and she's starting to jump. She only jumps an inch or two but she'll get better. 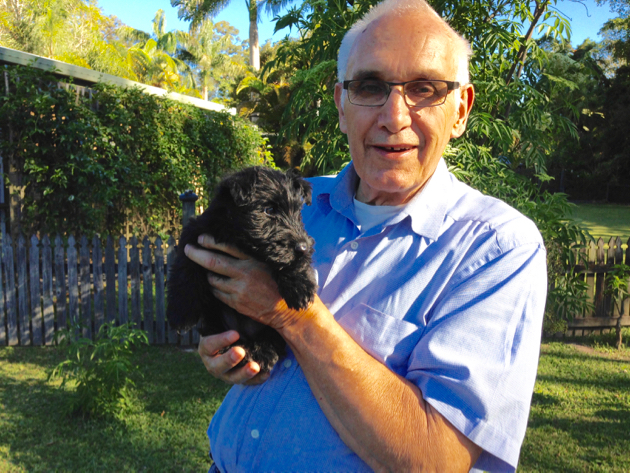 After having large Airedale Terriers, having this small puppy takes some getting used to. But we're enjoying her so much, even when she bites our toes. She's such an endearing puppy. I shared my scrambled egg with her this morning and she loved it. She also enjoys having a chicken wing for morning tea every day. She's even taken to burying it sometimes. The first time she dug it up, she walked over to me with the dirt covered wing in her mouth and I thought she's dug up a toad! There is something new every day with her and we're enjoying it very much. 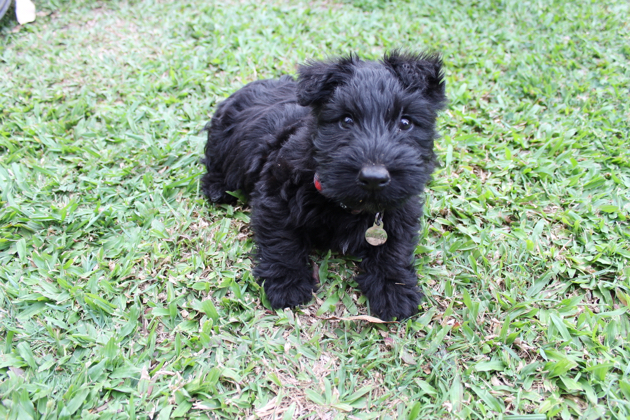 Next step is her final vaccination on Tuesday and then she's off to the groomer. Now that will be interesting. 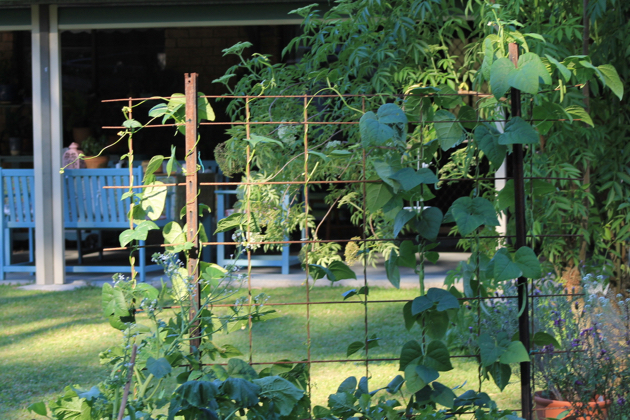 This time of year is about gardening for us, even with our smaller garden. 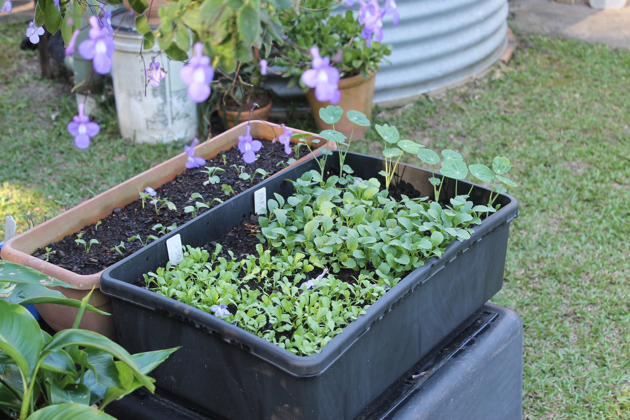 We start our gardening year in March and all through the cold months we grow winter crops. But when spring arrives we add more manure and compost to the soil and start on our tomatoes, chillies, herbs, capsicums, lettuce, cucumbers and green leaves. 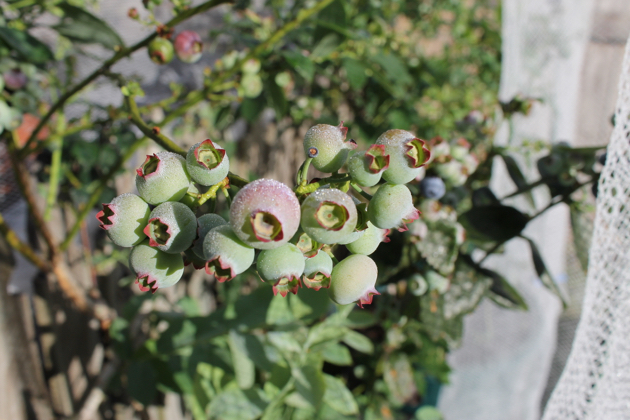 These crops are the exciting ones because they all have a big flavour punch and they look good in the garden. If we get it right, instead of paying high prices for watery tomatoes, cucumbers and chillies, we have our own organic heirloom varieties that with one taste yell: "This is why we grow our own food." 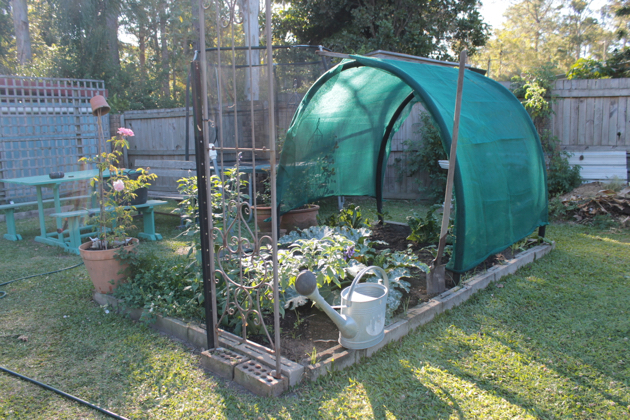 Hanno added a shade tunnel over the green leafy vegetables a couple of weeks ago. 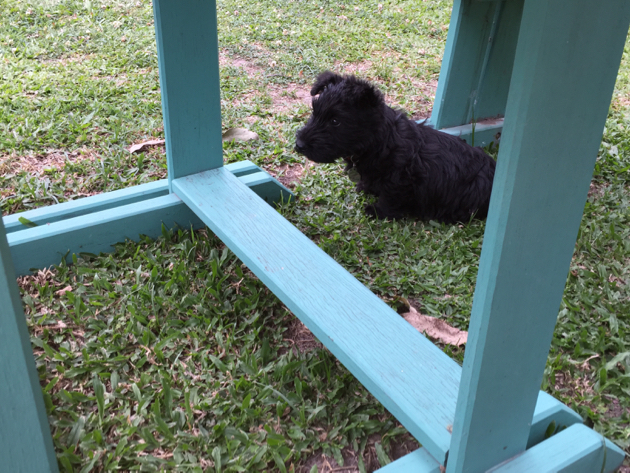 It's a simple structure made with four short star pegs, flexible black plastic pipe, shade cloth, a timber brace and hooks to attach the shade cloth to the pipe. The tunnel takes about 30 minutes to erect and depending on how long your star pegs are, you can bend over or stand straight to weed or harvest in the tunnel. 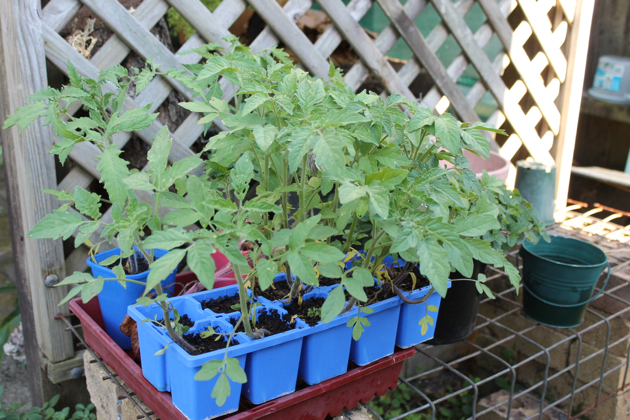 We've found it particularly handy during the early hot days when the plants haven't yet developed their tolerance to the hotter sun which burns tender salad leaves, tomatoes and capsicums. It's also a good defence against summer storms and wind. 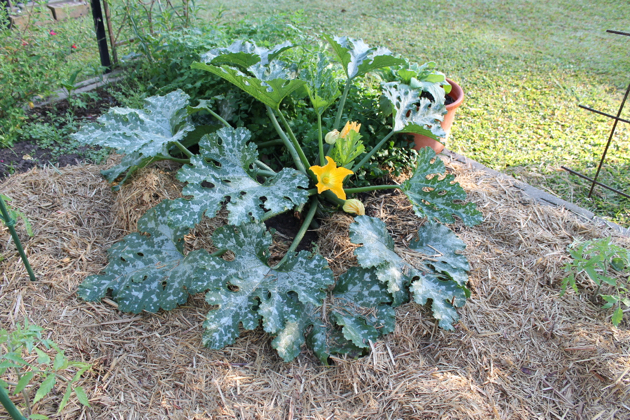 It won't prevent vegetables going to seed in the hot weather but with mulching and prudent watering, it will get you through a harsh summer better than you would without it. You can unhook the shade cloth if you need the height to weed or harvest. The timber brace just stops the centre of the shade cloth from sagging. Photos above and below are of the same plants. The top photo was taken 2 October, the bottom one 24 October. We're growing a French tomato, Rouge de Marmande, and an Oxheart. Both are heirloom varieties and both have few seeds. The French girl is great in salads and sandwiches and the Oxheart is for relish, cooking and sandwiches. 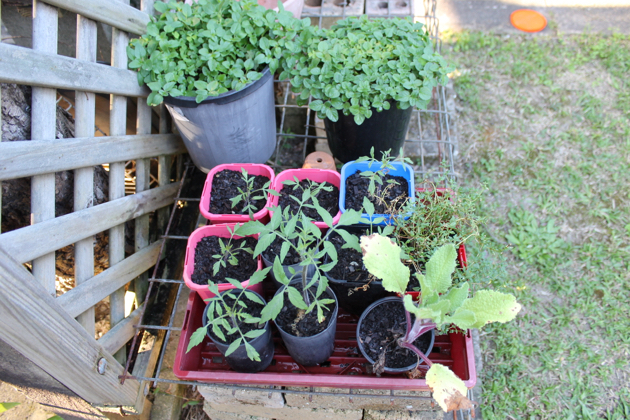 I sowed tomato seeds a few weeks ago and planted out the seedlings this week. 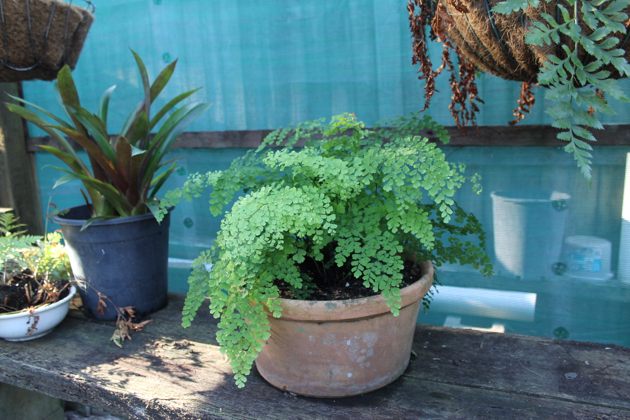 I like to pot the seedlings on from the small cells they start in and allow them to grow so by the time I plant them, they've almost outgrown their pot and have started to flower. 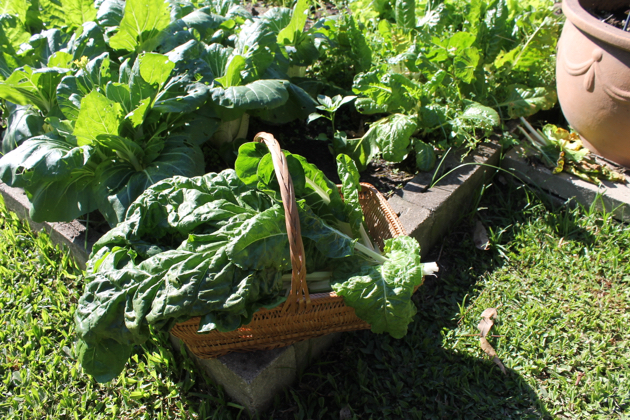 We always grow an organic garden and use the minimal amount of additions. 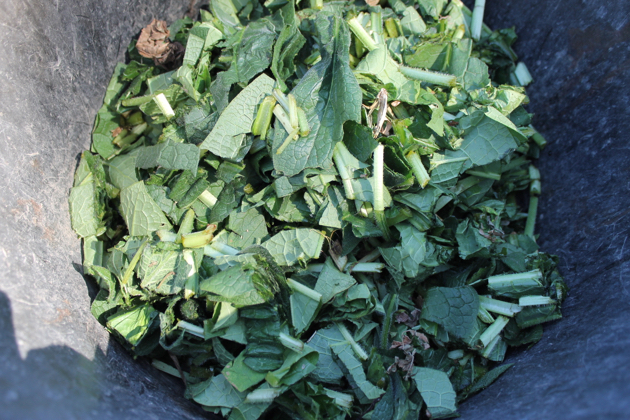 Instead of using commercial fertiliser, I make comfrey tea which is full of the nutrients most vegetables and fruit need. 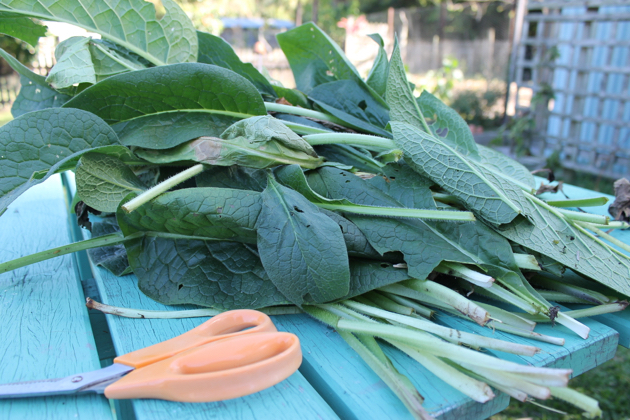 When we planted the tomatoes, I picked some comfrey, chopped it up and we placed a large hand-full of chopped leaves in each planting hole. As the days go by, those leaves will decompose and release their nutrients to the plants. I also gave each plant a drink of seeweed concentrate and liquid comfrey after they were planted. A bunch of comfrey was cut into small pieces and bruised so it would decompose faster, and then added to the tomato growing holes. 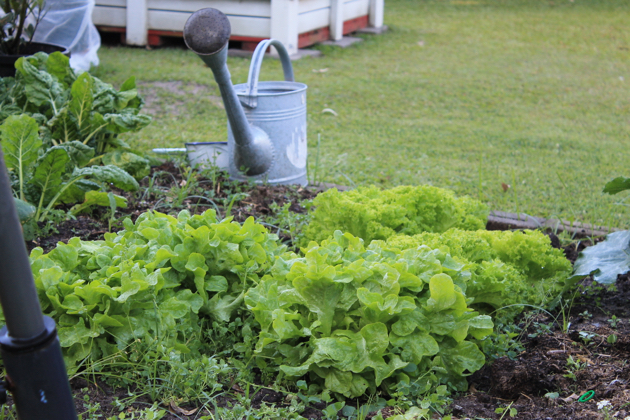 It's important to run a frugal garden just as it is to run a frugal home. When you plan out your garden, take into account all the water you'll use, the fertilisers you'll add as well as the cost of mulch and anything else you'll buy for your garden. When you do up your garden budget, you may find it's just not cost effective. So, what do you do if that happens? Decide whether the joy of gardening out-weighs the cost of the harvest and proceed accordingly. We have tanks here that hold 15,000 litres of rainwater and we never use tap water on the garden. We make our own compost and most of our fertilisers. We buy organic sugar cane mulch, sulphate of potash, seaweed concentrate and Dipel (a biological stomach poison for caterpillars that is organic and non-toxic). 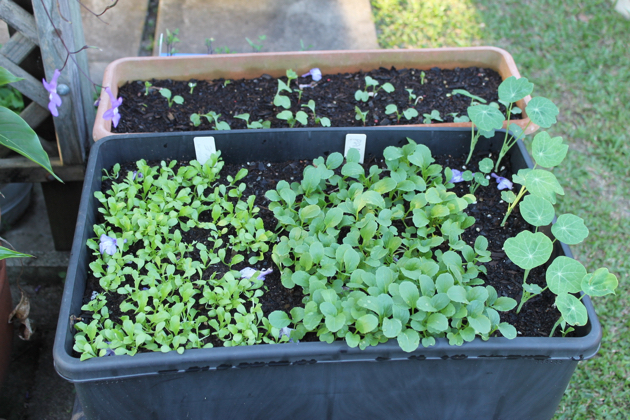 We buy some seedlings and seeds when we need them but if we can save seeds, we do that instead. Our shade structure was made using recycled materials we already had here. 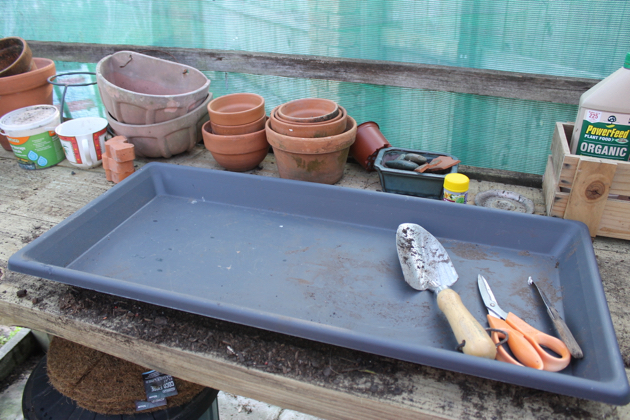 It's quite easy to save money in the garden so look around and work out what you can give a second life to, learn how to save and sow seeds and how to propagate. Those small things will save you money. It's been a productive time in the garden but I still take my time out there watching, sniffing, touching and enjoying what's around me. It gives me a good feeling to produce some of the food we eat, knowing it is as healthy and fresh as it can be. A garden will give you much more than vegetables, herbs and fruit if you let it. It gives a sense of peace and of connecting with the natural world, a place to think and a quiet haven from a noisy world. And when you create your garden make sure you have a few seats there to encourage lingering. This is the culprit. 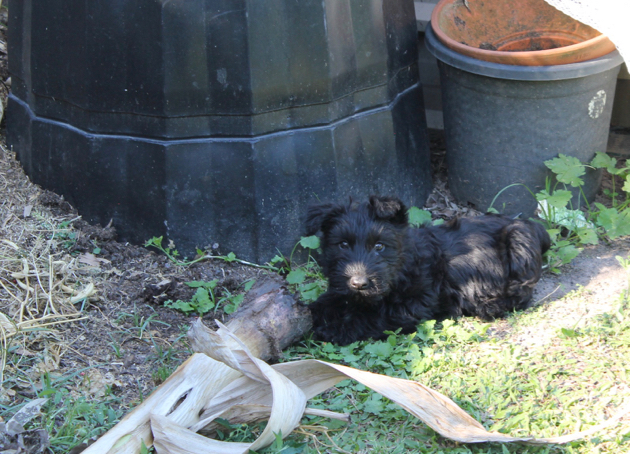 Gracie, caught red-handed removing rubbish from the compost heap. This time it was a banana sucker - she was chewing on the end of it! She's booked in to have her vaccinations on 1 November and after that we can take her out. Her first engagement is with the groomer. 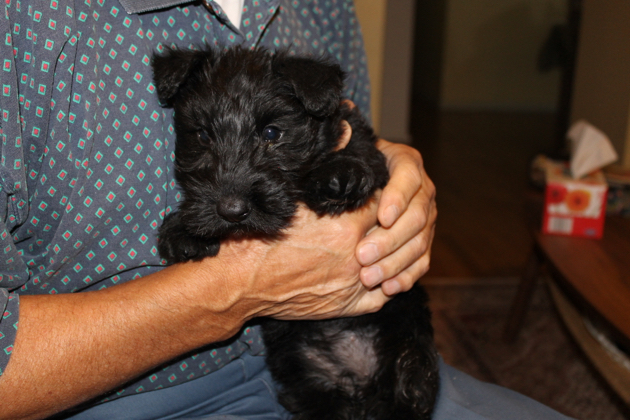 She's grown a lot of very thick fur and she's starting to look like a little black bear. I'm pleased to tell you that she's being an absolute joy, even though she likes chewing shoes and toes. A few readers asked about yoghurt starter cultures after yesterday's post so I thought I'd add to the information here. It really is a very good way of making yoghurt. I buy my culture from Green Living in Brisbane. They charge $16.95 for enough culture to make 100 litres. The culture is highly concentrated so even though you have the capacity to make that amount, it's a tiny parcel. I bought sour cream culture too and measuring spoons so I wouldn't over-measure and waste the culture. Every batch I've made has been perfect. I don't have any affiliation with this company but I have been impressed with their fast and efficient service. When you have your starter culture, you make yoghurt in the usual way but you use the culture instead of adding live, fresh yoghurt to your mix. 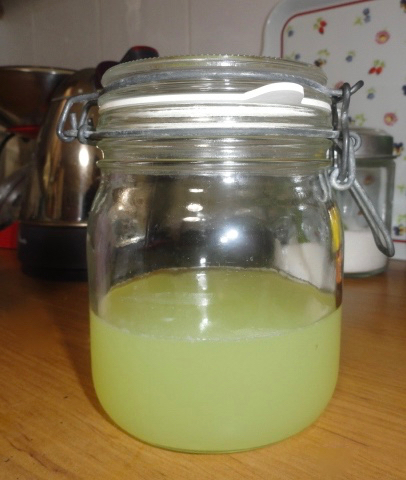 If you haven't made yoghurt before, here is an old post on the process, although now I use the Easiyo in the final stage to ferment the milk and I use starter culture instead of adding fresh yoghurt. For those unfamiliar with the Easiyo process, it's plastic one litre jar that fits inside an insulated container. Just before you place the filled jar into the container, you fill the base of it with boiling water. 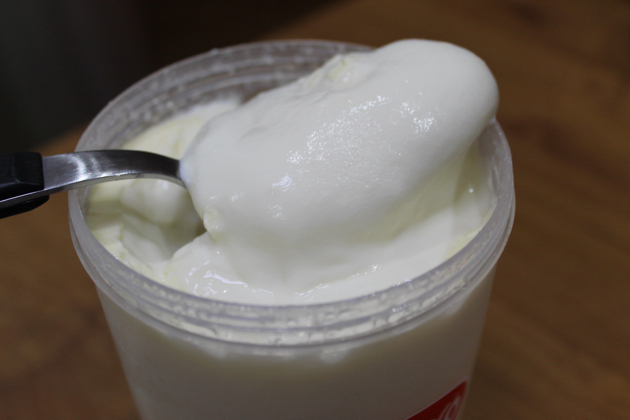 Sealing the jar inside the container with the hot water overnight gives you a simple and easy way to make yoghurt. 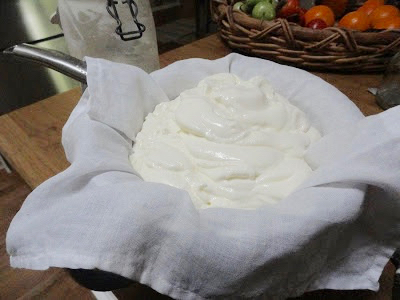 When the yoghurt is made, you can use it to make a simple fresh cheese called Labneh. All you need to do is to sit the yoghurt in a strainer with a loose weave cloth over it and allow it to drain for a few hours while it sits in the fridge. 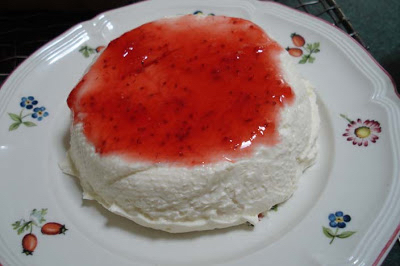 If you want to hurry the process, put a plate on top of the covered cheese with a large tin of fruit on top. That will press the cheese down while the whey is draining off. 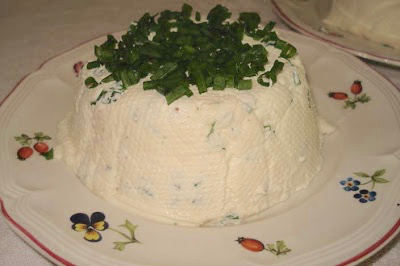 When most of the whey is gone what remains will be a much thicker yoghurt that, when shaped, makes a delicious cheese. At this point, it's over to you to add the flavourings you prefer. I always add ½ teaspoon of salt to the savoury Labnah, plus chilli, pepper, herbs, finely diced cucumbers or capsicum. Other flavour choices are dill, green onions, mint, honey, figs, candied fruit, jam etc. Hanno loves it on bread and crackers and it's a great replacement for store-bought cream or cottage cheese. Don't throw out that whey. You can use it in your baking. Cakes, scones and bread made with whey are excellent and nutritious. 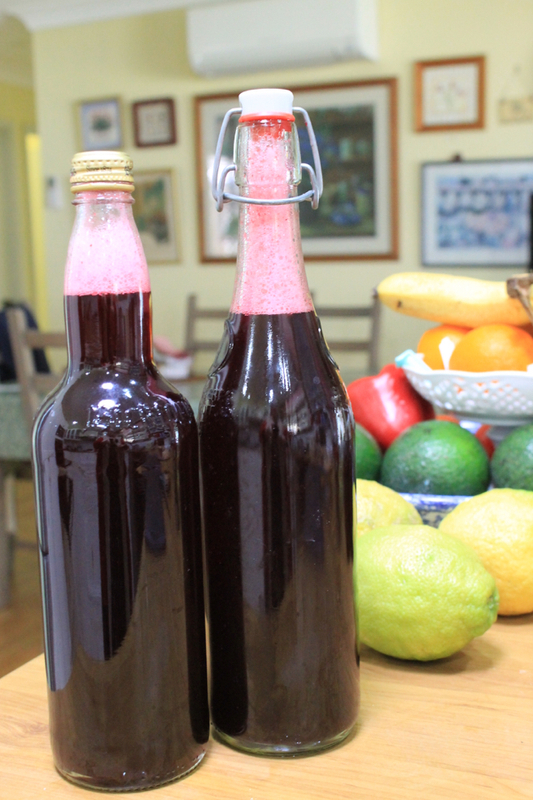 Labnah will last up to three weeks in the fridge. I have a dairy chapter in my last book, The Simple Home, which contains several other dairy concoctions that are easy to make and delicious. We've had so many visitors lately my head is spinning. Add to that my adorable grandkids and a new puppy and I'm starting to feel as if I need a few days with nothing to do. Those "nothing" days are valuable to all of us but from my experience, few of us get them. I make sure I have them now and have discovered that all the work I should have done during that time is always waiting for my return when I'm ready to get back into the swing of things. It's much more difficult to do that when you have a young family but even then you can give yourself a mini break, leave the beds unmade for a couple of days, forget about the laundry and serve your family eggs on toast for dinner. The world won't collapse while you take care of your own mental health. You probably won't be surprised at this but when I have my mini breaks, I still work, but I only do what I love to do. Being creative and working on projects that make our lives better gives me a feeling of self-reliance that builds my confidence and helps me feel in control and on track. I've had soap making on my to do list for a while now but still haven't made it; I hope today is soap day. I'm going to make my normal four ingredients soap using calendula-infused olive oil as my main oil. We suffer from eczema in my family. I have it and some of the others do too. I've found this soap to be nourishing on my skin and soothing on my eczema. I hope that if I tackle it with homemade soap before the hot weather starts, I should be able to get through summer with minimal itching and no cortisone cream. Making a blanket for Grace. I made yoghurt the other day. I buy culture online now. It makes a great thick yoghurt and it's cheaper than buying a live yoghurt starter from the supermarket. I used to freeze yoghurt to use as a starter but now I always forget to do it. The frozen culture works well for me. 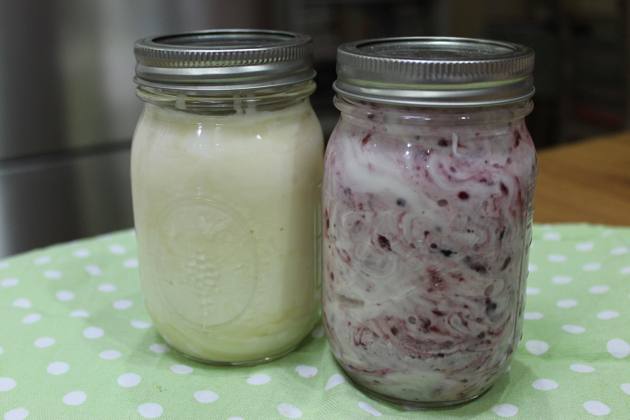 Instead of using a warm oven or yoghurt jars wrapped in towels to ferment the yoghurt, which is how I used to make it, I now use an Easijo insulated jar. I bought the insulated container when they were on special at the supermarket a few months ago, and it's working well. I don't use their powdered product. Fresh milk from the local dairy and frozen culture gives us good quality, delicious yoghurt for a really good price. Yesterday, after the yoghurt was made, I divided the batch in two, flavoured half with honey and the other half with good raspberry and blueberry jam. 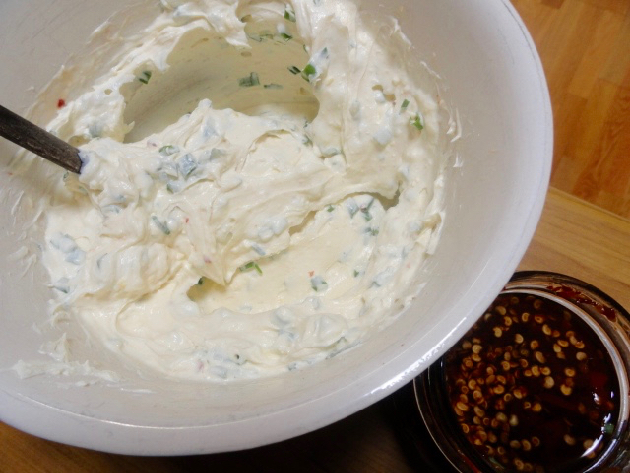 I'll make another batch in the next day or so and use it to make a savory fresh cheese for bread and crackers. Hanno loves it and I haven't made it for a long time. It's good to get back to these things and to enjoy the time I spend making them. 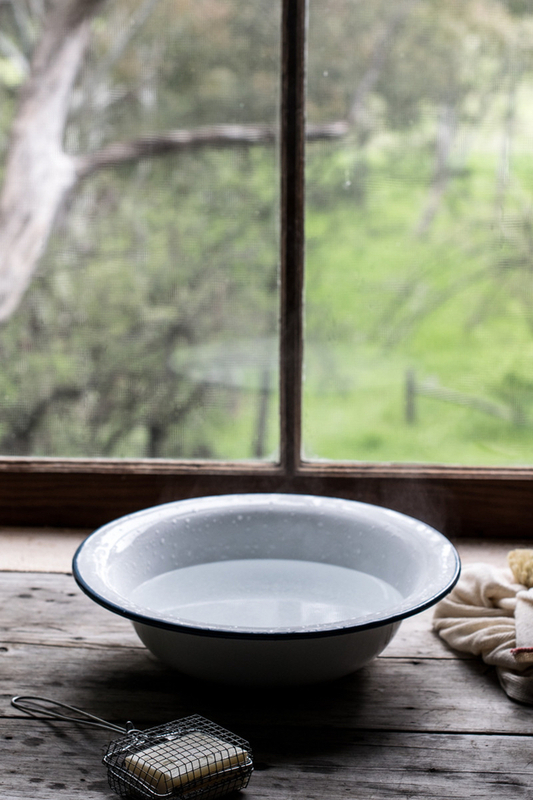 I discovered many years ago that when I make cakes, soap, gifts or another set of dishcloths, when I repair and recycle, when I budget and organise, along with all that, I make the life I want to live too. Each small creation, all the meals and bread and cordials, all the knitting, sewing, mending and gardening, bit by bit, it all adds to this wonderful life we've built here. I wonder if you feel the same way. We're celebrating over at the Down to Earth forum this weekend. It's our seventh birthday! The forum has well over 8000 members now and continues to grow steadily. If you haven't visited yet, or not for a long time, go over and have a look. We're organising a few special threads and some fun activities. There will even be a couple of prizes up for grabs. But even if you don't win a prize, you'll find a lot of information about simplifying life in a forum full of friendly folk from the four corners of the earth. Come and join us. The rise of home "unschoolers"
With robots, is a life without work one we'd want to live? It was a dream day here yesterday. I didn't have much work to do so I took some time on the computer to research various things and I caught up with my friend Morag on Skype. Lunch was leftovers, so no cooking, in the afternoon I made a batch of yoghurt. Yes, that is mud on her nose. She could hear the kids playing next door so she sat and listened to them for a while. 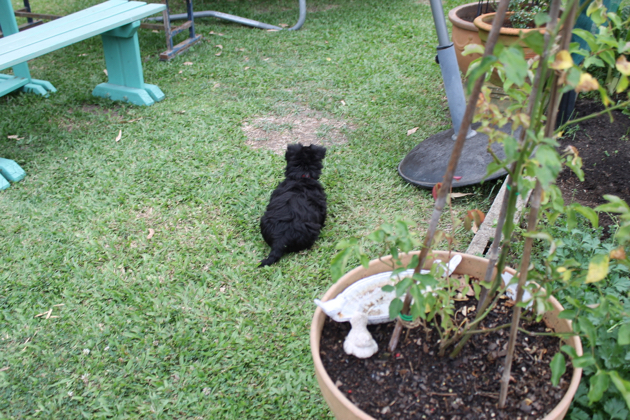 Gracie and I spent time in the garden so she can become accustomed to the sights and smells there. She such a scallywag! 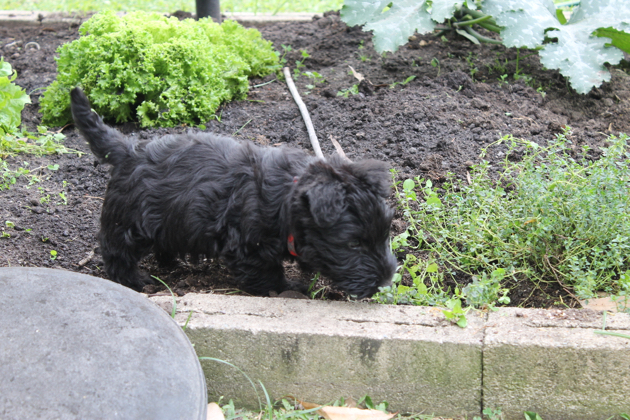 She started digging in the garden bed Hanno weeded and prepared for planting today. 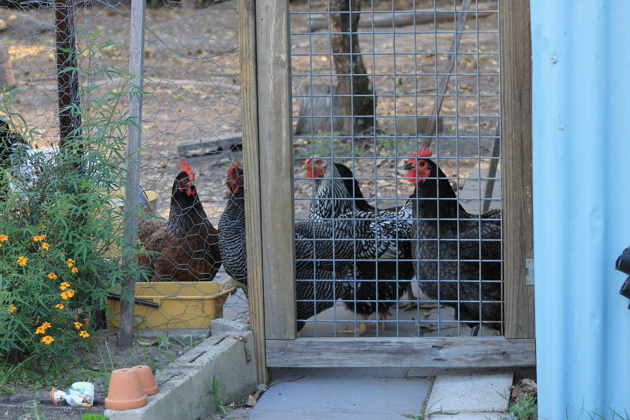 She sat at the chicken run gate and watched the chooks. She was scared by cockatoos screeching in the trees overhead and when the kids next door came home from school, she sat and listened intently to them play. She was born into a family with six children so I'm guessing she's missing them. Inside she runs off with our shoes and shakes the living daylights out of her pink and while sponge ball. She's constantly with us. She loves sitting next to either of us with her body touching our feet. I'm pleased to tell you she's been an absolute delight and hasn't cried at night at all. Toilet training is going slowly but she's only two months old so I'm not worried about it. Overall she continues to be a dream puppy. Today will be busier because I'll cook lunch and I have plans to make lemon cordial and a batch of calendula soap. Two litres of lemon juice is defrosting on the sink and soon I'll strain calendula-infused olive oil for the soap. I haven't made soap for a while and I'm looking forward to it. I'll let you know how it turns out. Life is slowly returning to how it was before I started writing books. There is time for friends, reading, research, crafts and wandering around the garden with nothing much to do. There is a lot to be said for dawdling. It might not look like much is going on but often it's exactly what's need to keep going. 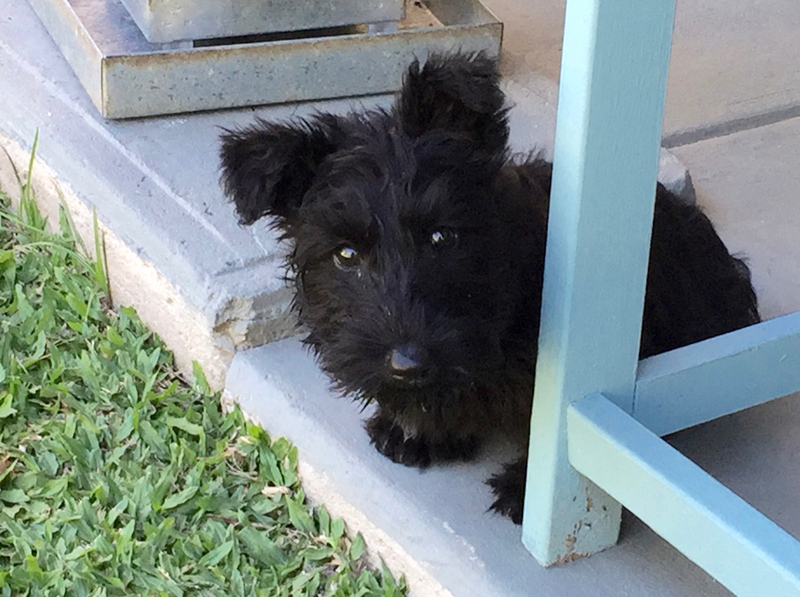 Most of you know that our Gracie arrived on Wednesday and we've had a couple of days to get used to each other. She's such a joy and I'm sure we'll have many happy years ahead with her. 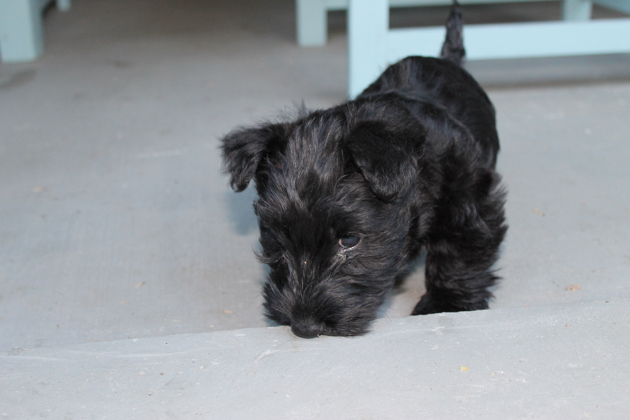 She's tiny at the moment, just 2.2kg/4.8lbs, and we're working out how much she needs to eat, and when. She's been no trouble at night. She sleeps on the floor in a big box next to Hanno's side of the bed. She's woken twice during the night and she goes back to sleep straight away when he pats her. She just needs some reassurance, and to know we're there with her. We had our first outing with her this morning when we went to the vet. The vet nurse wanted to take her photo and other people asked about her. But I guess the big test will be tomorrow when all the grandkids are here. I don't expect any problems, we just need to establish a few rules. Ruby's best bakes - my sister bought Ruby's cook book and when I was staying with her, I baked one of the cakes. It was superb. It looks like there are some very good recipes in this link. 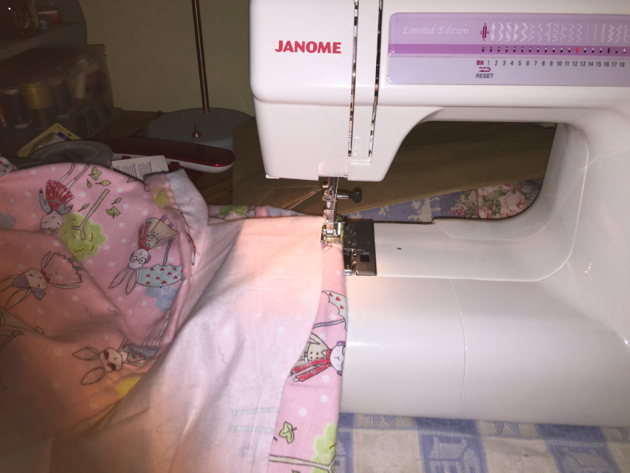 Tutorial for making a lovely clothes line - this is a Norwegian blog but there's a translate button at the top of the page. Here she is! 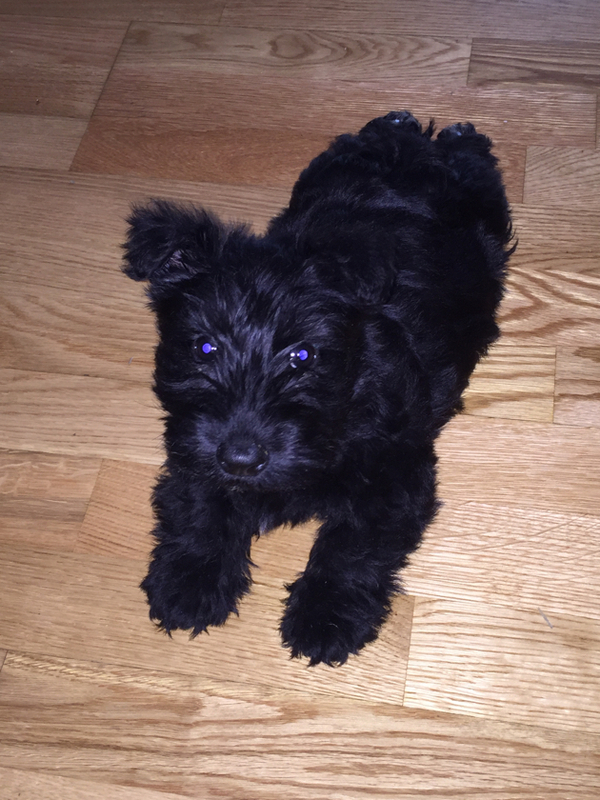 Meet Grace/Gracie, our two month old Scottish Terrier. We picked her up from the airport yesterday and she's currently settling into our home and making us smile - a lot. 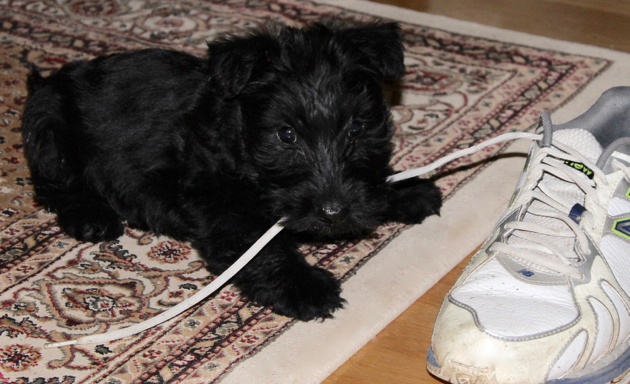 She's eating and drinking well and pulling Hanno's shoes around by the laces. She slept well last night, only waking once for a little cry. She's in a box she can't escape from right next to our bed and she looks pretty comfy in there with her warm fleeces. At the moment we're feeding her Black Hawk puppy biscuits, a chicken, rice and vegetables meal I make myself, water and lactose-free milk. If we run out of home cooked food and can't make one up that day, we'll give her a small tin of salmon, tuna or sardines. So far she likes all the food I've given her. I did some research on puppy and dog food while we were waiting for Grace to arrive, and in opinion, much of the commercial biscuits and tinned food isn't fit for a dog. They contain by-products, corn and wheat which aren't good for dogs or puppies. We're taking Gracie to our vet tomorrow for a check up and I'll discuss her diet with him. I definitely don't want her to eat those vet endorsed meals or biscuits, I don't want her to eat the science meals, I want her to eat good fresh food cooked here in my kitchen so I know what's in her food. 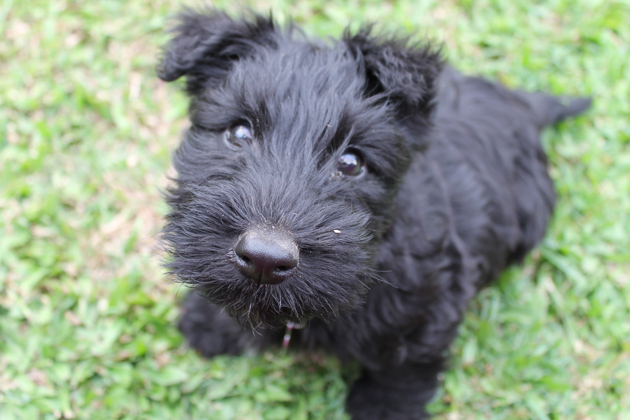 Here is a review of the current dog and puppy foods on sale in Australia. It's very interesting reading. If you have a dog, check what you're feeding your pet, it might surprise you. I'm surprised that well known vets recommend what they do. Of course you need to keep your pet foods within your family budget but buying commercial foods that contain non-specified ingredients or "meat by-products" isn't the best way to do that. I'll do a post the next time I make Gracie's food and price it up for you. I think home cooked food gives the best value for money and will keep your pet healthy for a long time. You can put it all in a crockpot and cook it overnight, so it doesn't take a long time to produce good pet food. One of the things I love about gardens is how different they all are. Even those that look the same have different elements that make them unique. Our garden used to be different to what it is now. 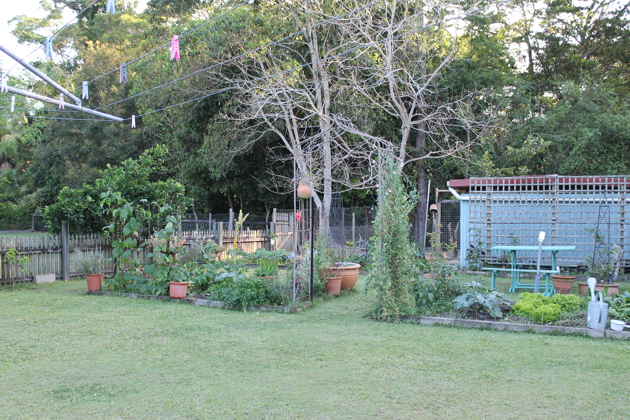 We used to have a fairly large productive garden but as we aged, the garden got smaller. 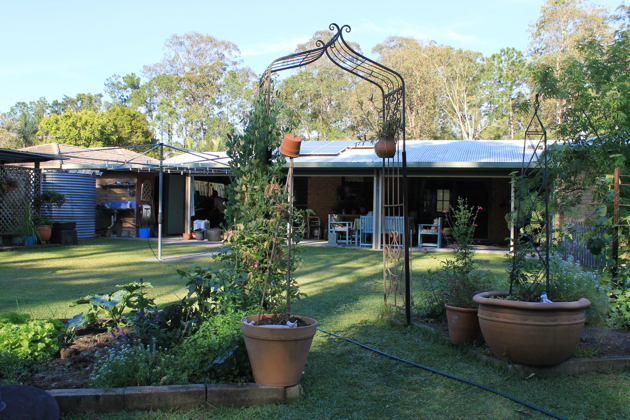 Now we grow all our herbs and some of our fruit and vegetables. Doing that we still keep our hand in, what we grow is organic, we save a bit of money and we enjoy it. 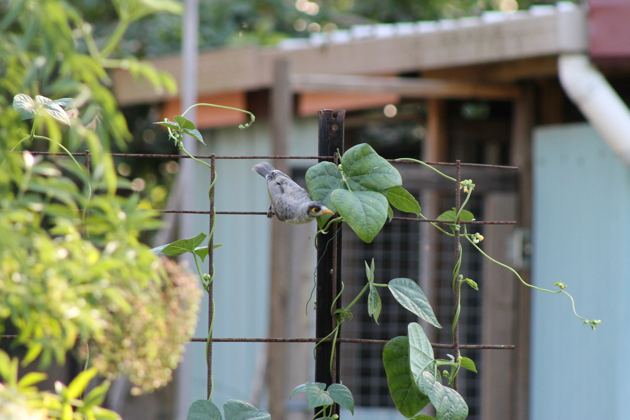 Many birds visit our garden every day. 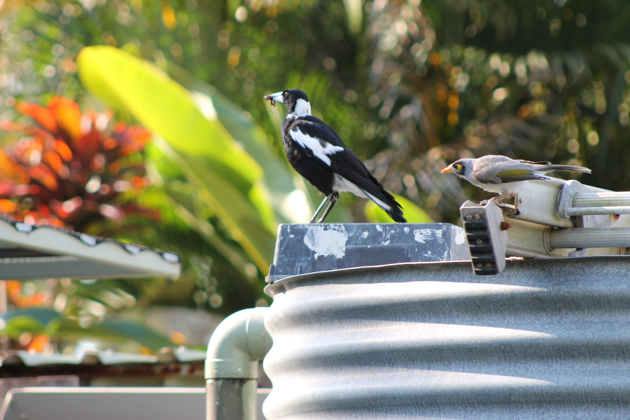 This fellow is a native miner, below he is on top of the tank trying to relieve our friendly magpie of a worm she just caught. I confess I'm a creature of habit. 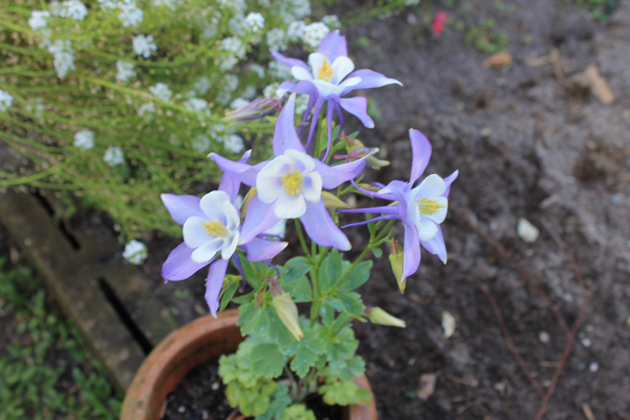 This is one of the flowers I always grow in spring - columbine (granny's bonnet). That, along with roses, alyssum, cosmos and violas are always there in the cooler months. This year I added a swag of Dutch iris after Tricia "found" some seeds in spent flowers on her walk last year. When you sink your hands into the soil, you could be a million miles away from the cult of consumption we've established on the planet in recent years. Most of what you touch in a garden is natural and most of what you're doing is hoping to create beauty, produce food and live true to your understanding of self-reliance. If you spend time in a garden and experience what it is and how it feels, you'll usually come away feeling an inner peace you didn't have earlier in the day. Over the past 50 years I think we've tended to trade our peace for more time at work, or out in the world doing whatever it is we do. I'm not pointing the finger, I did it too. But now I think it's important to make time for the small quiet times because they have the potential to restore balance and help us develop the strength to keep going. There is a very thin line between making time to be in your garden and putting it off for another day. It's easy to put it off and think that other things are more important. But I encourage you to think carefully about giving yourself those brief periods of solitude because you'll gain so much by being in the garden - walking and thinking, or just sitting, looking and breathing deeply. This is the interior of my bush house. 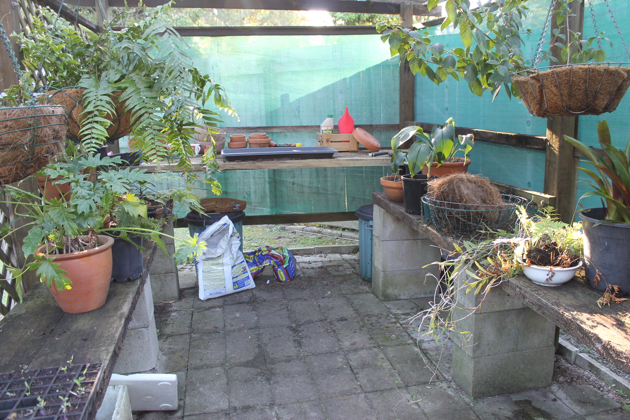 It's where I pot plants, plant seeds, tend ailing plants and keep tender plants over summer. Lucky I took this photo because I just saw a polystyrene box under the bench that I use for rubbish. I'll have to move that before we bring our puppy home tomorrow. 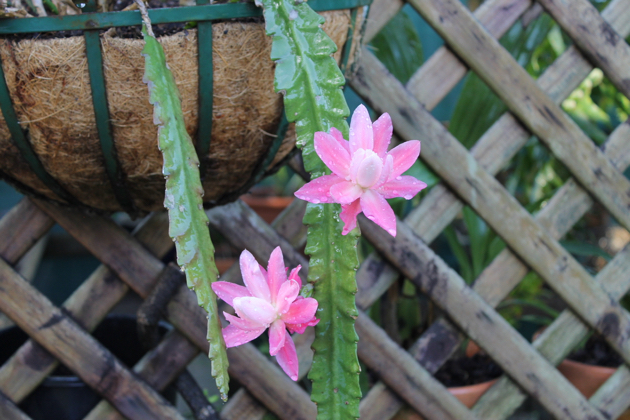 These flowering cactus are on the outside of the bush house. 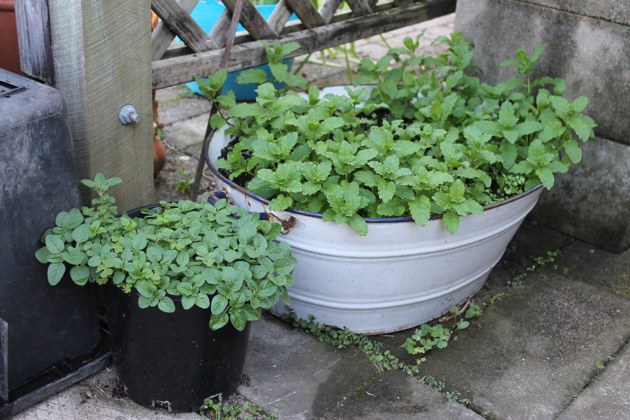 Mint growing in an antique enamel baby bath and a pot of oregano. Both these herbs grow better in partial shade here. Tomato seedlings above with borage, common thyme and more oregano. 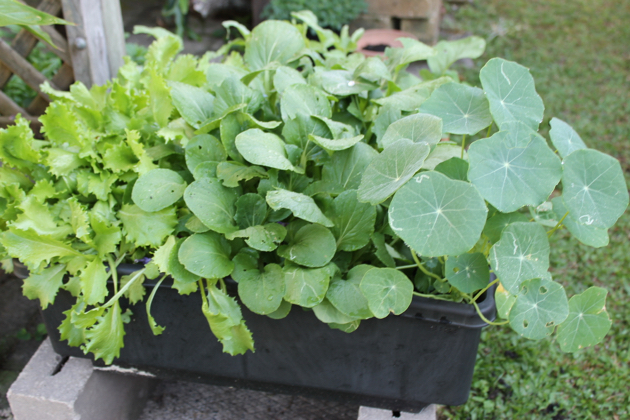 Below are trays of radishes, lettuce, bok choi and nasturtiums. I'll keep growing these tomatoes in pots for another three weeks and when they start flowering, I'll plant them out in the garden. 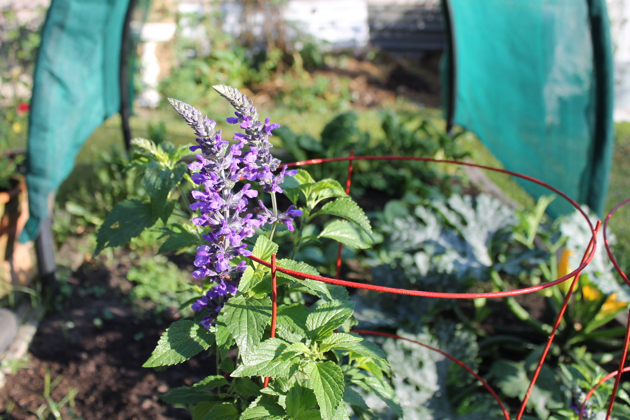 The slowness of gardens might help slow you down, and for me, that's one of the many benefits of gardening. I used to be extremely impatient. I wanted everything NOW. I've grown out of that and I'm much more accepting of a natural pace for most things. I think I was helped in that acceptance because I was watching plants grow and nothing, nothing at all, made them grow faster. The reverse has happened to seasons. When I was young, the seasons I experienced moved at snail pace, now it's all much faster. Years go faster, weeks seem like days, days fly by. Gardens aren't only for growing food or flowers, they're also a bustling ecosystem contained within a quiet haven where you can sit or walk and enjoy the plants and the sense of peace they bring. When you garden, you, the gardener, make exactly the garden you want. So be bold, throw caution to the wind, make your wildest dreams germinate in your soil. Your garden may fill an acre or be contained in a few pots but whatever it is, tend it, observe, breathe it in, appreciate it, look around and then slow down and experience the experience. 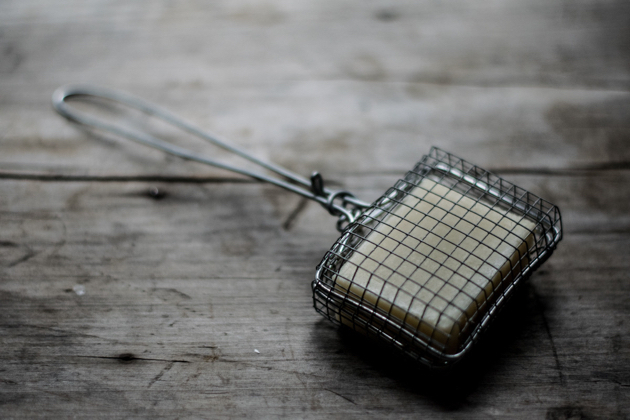 I know there are many readers out there who have been searching for a soap saver, well, I just opened Odgers and McClelland's latest newsletter and they have them in the shop now! Click here to see the ad. They're only $32.95, made in Australia and look very sturdy. I'm very proud to have Odgers and McClelland Exchange Stores as one of my sponsors. They sell good quality household items that are hard to find nowadays. Check out Megan and Duncan's online catalogue and choose from their wide range of products. I've shopped in the store and have had things sent in the post and I got excellent service each time. Have a look at the Falcon enamel ware - I have all the spoons and ladles and they are getting a good work-out in my kitchen. I've been thinking about ordering the Falcon square cake tin. Now that I have grandchildren, my preference is for slab cakes - little kids can't handle a tall slice of cake. This tray would suit my whole orange cake and chocolate yoghurt cake perfectly. Megan has been using it for her brownies and semolina cake. It looks like a winner to me. I'm also thinking of ordering the Robert Gordon glass honey pot. I have a few Robert Gordon jugs and they're constantly on my kitchen table serving up water or juice. This honey pot looks like just the thing to serve honey at the table too. We have a lot of people in our family who have honey in their tea. And speaking of tea, look at these beautiful tea strainers! I never use tea bags so I'm a bit of an expert when it comes to tea strainers. I love these. If I order the cake tin, one of these strainers will be in the parcel too. 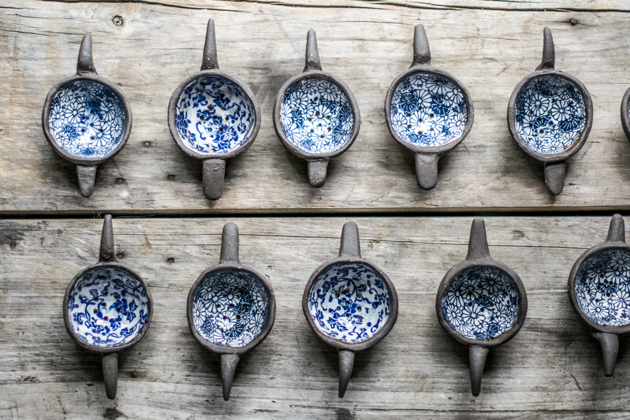 Tea strainers, made by local potter Sasha Jury-Radford. If you want to get some early Christmas gifts, now would be a good time - before the rush starts. But don't worry if you have no time now, I'll be reminding you again in about a month about Christmas shopping to support my sponsors.